The Arab’s Ride to Cairo, A Legend of the Desert written by E.J. White Melville, illustrated and illuminated by Mrs. Wolfe Murray. 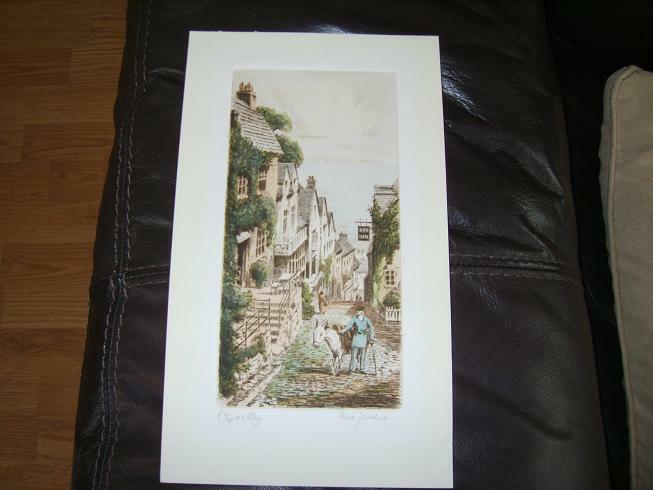 Published circa.1855-1857 by Seton & Mackenzie, Edinburgh and Houlston & Stoneman, London. 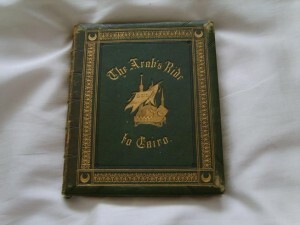 The book is presented in green morocco with gilt vignette and title writing within a gilt decor border on front and rear covers. 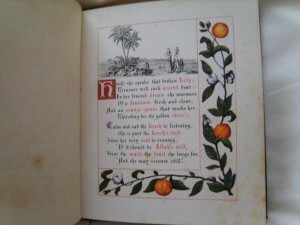 The book has 14 card leaves printed one side only with the text in red and black ink and each page has a wide decor, illuminated borders and pictorial page headers and are all pages are edged with gilt. The book measures; 220ml. H. x 185ml. W. approx. 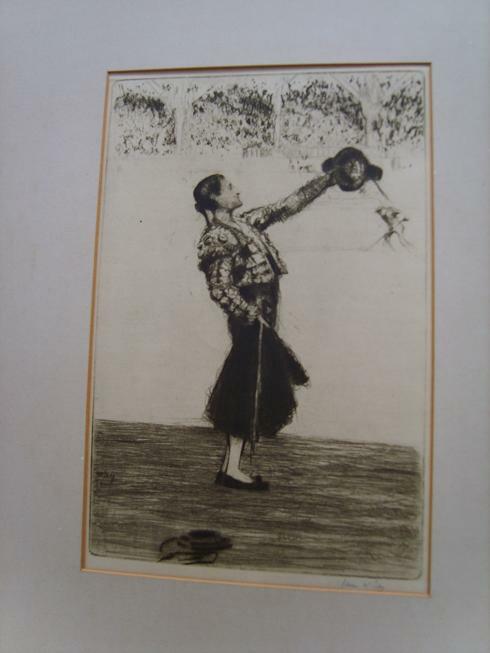 There is a dedication written in black ink in the front of the book and is dated, Jan. 26th 1857. 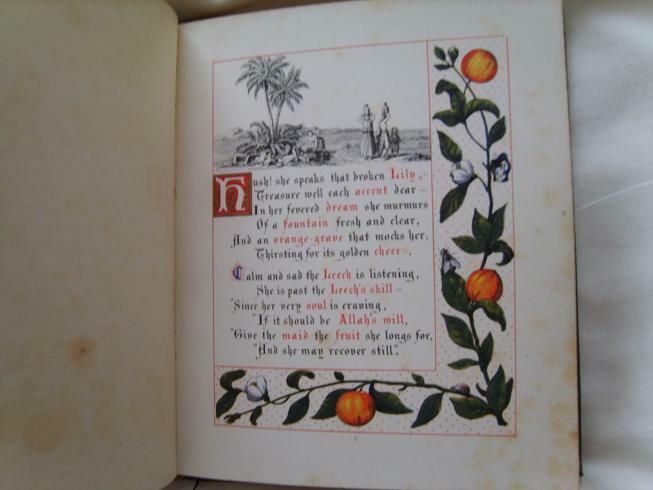 The books condition is; small scuff marks to front and rear cover corners, very slight scuffing to front and rear covers, small amount of foxing to inside pages, the condition of the text and illustrations are still very bright. Shows slight movement in the spine but is still attached well, still has all the protective sheets between the illustrated pages and bears a dedication to Her Royal Highness, The Duchess of Gloucester. 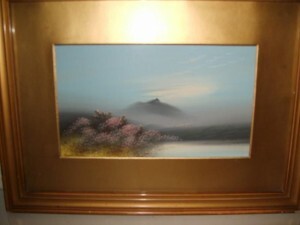 (Q.) 010311 (click on picture for larger image) Please see payment options. 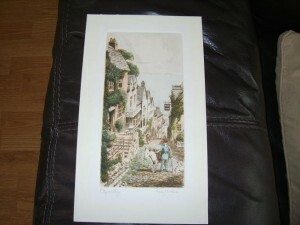 Price: £55.00p, includes p&p, Mainland U.K. only. 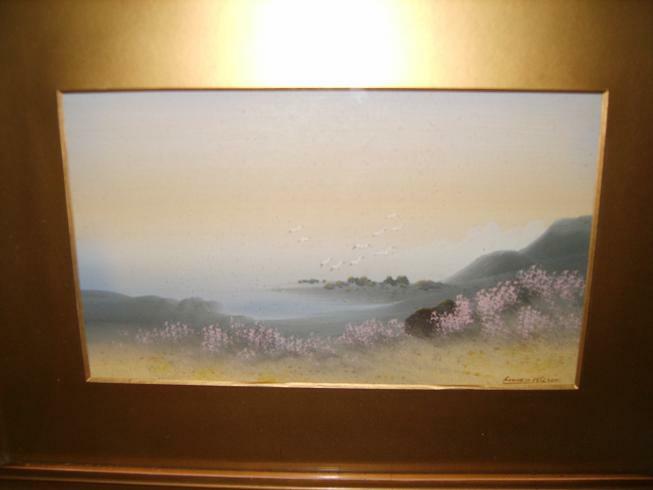 A lovely tranquil moorland scene by a talented and prolific Scottish Artist Furness Wilson a well known artist of the period 1910 – 1940 then nothing much heard from him after then, his works are very similar to the artist Frank Holme. These water colour/gouache paintings are very nice quality little paintings that certainly catch the eye. (click on picture to enlarge image) Please see payment options. 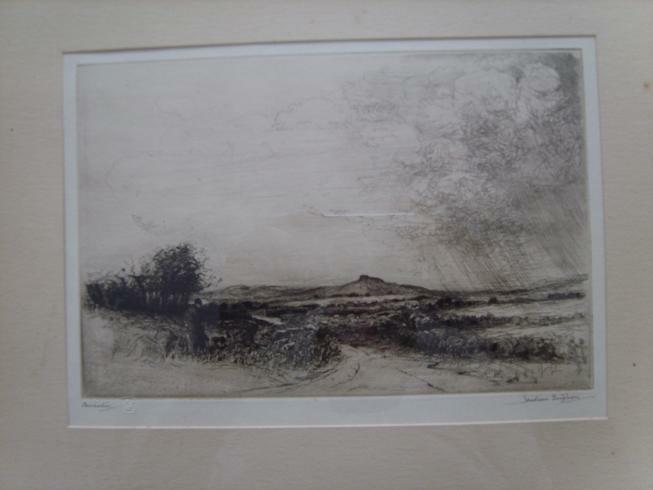 (F.)180612 Item A.
Jackson Simpson signed Etching of Bennachie, Scotland. Coloured Etching of Clovelly, Devon and The New Inn. 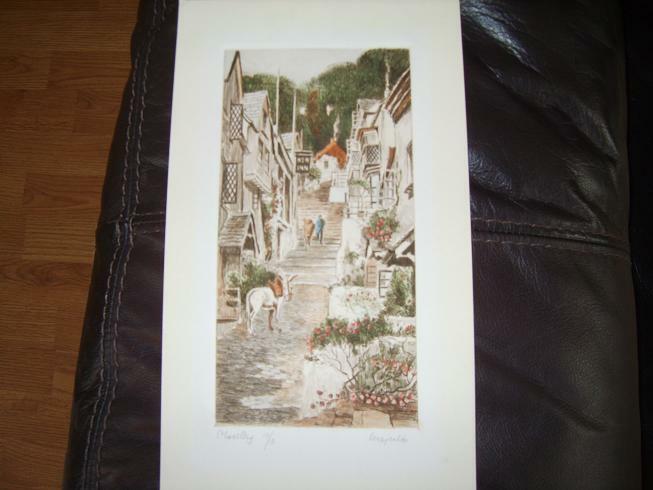 Price: £28.00p, includes p&p, mainland U.K. only. Fred Arthur Farrell, Signed Etching, Horse Guards Parade, Whitehall, London. 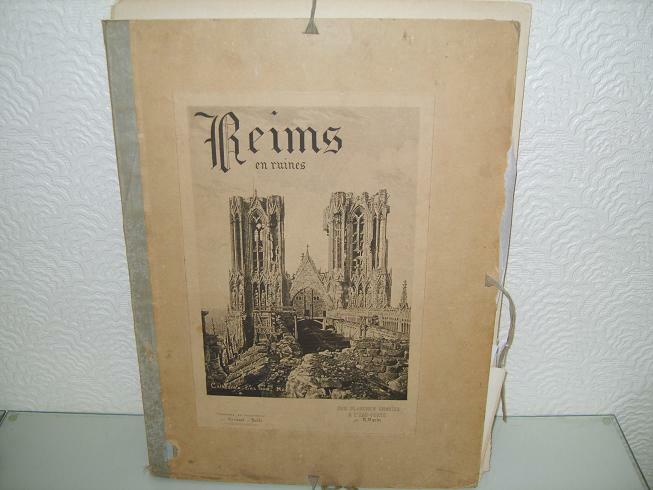 This is the original folder that goes with the set of ten pencil signed engravings of Reims in Ruins by Raoul Varin, the folder is in reasonable condition with slight wear and tear at bottom of spine, has scuffs to outer edges and corners of folder and hand marks/staining to front. Still has the original ribbons on for securing shut the folder. Nearly 100yrs. old so this is probably in better condition and below the normal wear for the age. 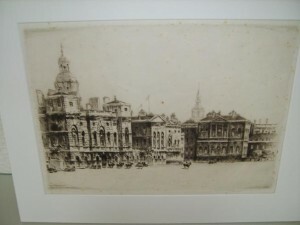 All ten of the engravings are in very fine condition and photos of these can be emailed to interested buyers. 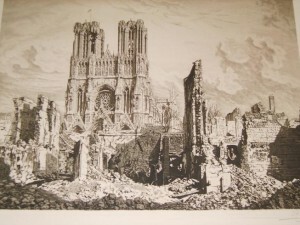 Please see details on the Reims pictures for full details of the set of 10 Raoul Varin, Reims in Ruins Signed Engravings. An exceptionaly rare and complete quality set of 10 pencil signed engravings in original cover/folder of Reims in Ruins by Raoul Varin, featuring the First World War bomb damage of The Cathedral Notre Dame in Paris. This is just one of two plus the folder shown on this website, photos of the other engravings can be emailed if needed. 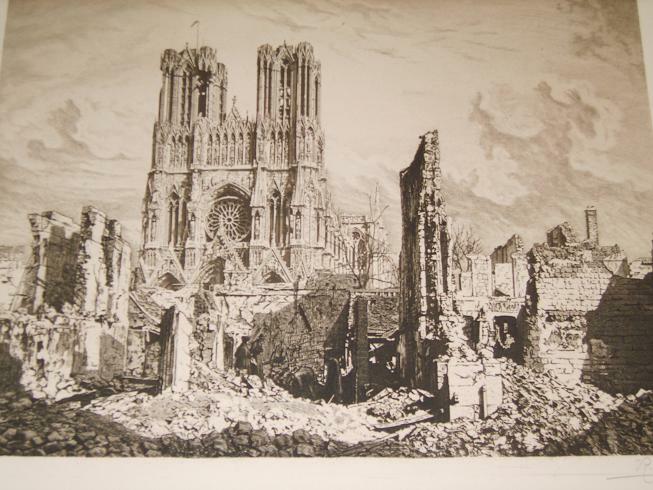 All ten engravings are in very fine condition. Payment by Bank Transfer on this item please. (email or telephone for details … 07988.506321) Enquiries please phone or email. Price: £2,200.00p, for full set of 10 and folder, includes p&p, for mainland U.K. only.